A substantial PERIOD DETACHED family home set on a SPACIOUS PLOT of approximately 0.41 acres with FOUR GENEROUSLY PROPORTIONED BEDROOMS. Good size garden, ample parking and turning space as well as TWO GARAGES. A substantial period detached family home set on a spacious plot of approximately 0.41 acres (0.61 hectares) built in brick under a rosemary clay tile roof and set in this highly desirable location in the heart of Sandal. With predominantly UPVC sealed unit double glazed windows and a gas fired central heating system, this stunning detached house is approached via an entrance hallway that leads through into a central reception hall. The main living room spans the full depth of the property and leads through into a conservatory to the rear overlooking the South facing gardens. There is a separate substantial dining room with a splay bay window also overlooking the gardens together with a separate morning room. Off the reception hall there is a guest w.c. and the ground floor accommodation is coupled by a well proportioned kitchen. To the first floor there are four generously proportioned bedrooms, which are served by a bathroom with a separate w.c.
A particular feature of this lovely family home are the gardens. The property stands on a generously size plot with potential for further development in the rear garden, subject to all the usual statutory consents. The property has ample parking and turning space as well as two garages. The property is situated in the heart of Sandal in one of the most prestigious locations in the area. There is a good range of local shops, schools and recreational facilities close at hand and a more extensive range of amenities in the nearby city centre of Wakefield. The national motorway network is readily accessible. ENTRANCE HALL 4' 11" x 4' 3" (1.5m x 1.3m) UPVC double front entrance door, central heating radiator and an archway through to the reception hall. RECEPTION HALL 14' 5" x 9' 10" max (4.4m x 3.0m) Frosted window to the front, return staircase to the first floor, built in cupboards and a delft rack. GUEST CLOAKROOM/W.C. 6' 6" x 2' 7" (2.0m x 0.8m) Frosted window to the front, wall mounted wash basin, low suite w.c. and storage area. Part tiled walls. LIVING ROOM 23' 3" x 14' 1" (7.1m x 4.3m) With windows to both the front and side, French doors to the conservatory, three central heating radiators, moulded ceiling cornice, five wall light points and a tiled fireplace housing a gas fire. CONSERVATORY 10' 2" x 10' 2" (3.1m x 3.1m) With windows to three sides and an external door, double central heating radiator. DINING ROOM 14' 5" x 14' 5" (4.4m x 4.4m) plus a splay bay window Double central heating radiator, moulded ceiling corned, delft rack, feature fireplace with an attractive wooden surround with tiled inset and hearth housing an electric fire, splay bay window to the rear. MORNING ROOM 13' 1" x 10' 9" (4.0m x 3.3m) Window to the side and sliding French doors to the rear. Central heating radiator, parquet flooring and fitted shelving and cupboards. KITCHEN 13' 1" x 11' 9" (4.0m x 3.6m) With a double central heating radiator, windows to both the front and side and an external UPVC door to the side. A range of wall and base units with laminate worktops incorporating stainless steel sink unit and a stainless steel five ring gas hob. Built in double oven, space and plumbing for a washing machine and dishwasher, space for a condensing tumble dryer and space for a fridge freezer. Wall mounted British Gas gas fired central heating boiler. FIRST FLOOR LANDING A spacious landing with a window to the front, two sets of built in cupboards, loft access point and central heating radiator. BEDROOM ONE 15' 1" x 14' 1" (4.6m x 4.3m) With window to the side and rear. Fitted with a broad range of wardrobes with cupboards over and matching drawer units incorporating a dressing table and a vanity sink. Double central heating radiator. BEDROOM TWO 14' 1" x 14' 5" (4.3m x 4.4m) With a window overlooking the rear garden, picture rail, built in double fronted wardrobe, further wardrobe and drawer units. Vanity sink unit and double central heating radiator. BEDROOM THREE 13' 1" x 11' 1" (4.0m x 3.4m) With a window overlooking the rear garden, central heating radiator and a vanity sink. Picture rail. BEDROOM FOUR 12' 5" x 7' 6" (3.8m x 2.3m) With windows to both the front and side, central heating radiator and a further recess with a built in double wardrobe. BATHROOM 11' 5" x 9' 6" max (3.5m x 2.9m) With a frosted window to the front and fitted with a four piece suite comprising wide panelled bath, separate shower cubicle, vanity wash basin with cupboards under and bidet. Central heating radiator, part tiled walls and an airing cupboard housing the insulated hot water cylinder. SEPARATE W.C. 4' 11" x 2' 7" (1.5m x 0.8m) Window to the side, hatch to the secondary loft and having part tiled walls. Fitted with a low suite w.c. Central heating radiator. OUTSIDE The property is approached via a sloping driveway that provides ample off street parking and turning space as well as leading to two separate garages. To the front of the property there is an established garden with mature shrubs and trees, whilst to the side there is a lawned garden, which extends round to the rear. The rear has a much larger garden plot with a very pleasant Southerly aspect and being laid predominately to lawn with mature beds and borders as well as established trees. The rear of the house has a patio seating area together with a greenhouse. 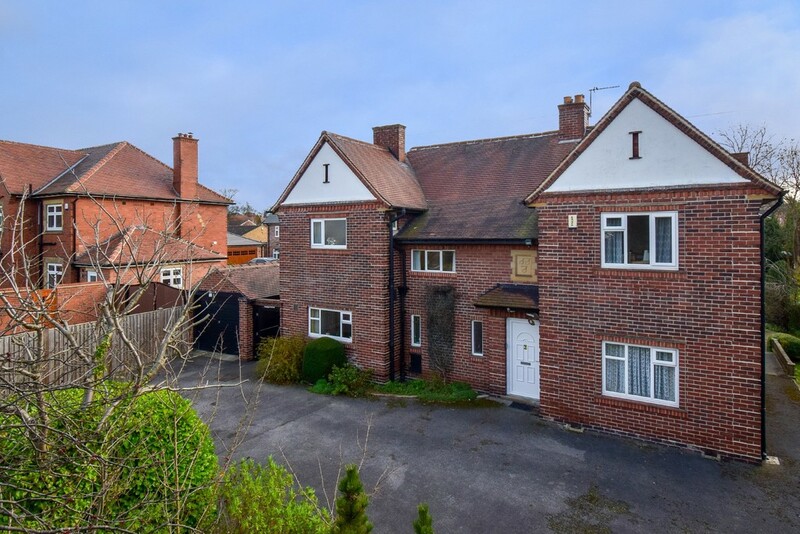 Prospective purchasers should note that the neighbouring properties have both developed the rear garden into separate dwellings and subject to the usual statutory consents there is this potential here too.